At first glance, this sixteen minute short film is something of a pretentious piece for the artistic and academic crowd dealing with the universal head scratcher that is, "what is the meaning of life?" Of course, when given the necessary dues this animated short comes to mean much more than simply a restating of existential questions heard many times before. While writer/director Don Hertzfeldt has been crafting such animated shorts for upwards of twenty years now this was my first foray into his world and what an impression it has left. If nothing else, the large ideas presented in such simplistic form are a staggering juxtaposition of where we come from and what we come to be is enough to grapple with, but this idea and this attempt to cut to the core of the actual meaning in our existence is what impresses more. In essence, World of Tomorrow is a compact science fiction epic that quickly and concisely sets up its plot of a clone of a clone who, 227 years from the modern setting of the film, contacts her original self to tell her about what her life is going to be like for her remaining years (which just so happens to be a few centuries). Sound complicated? Sure-it could easily be construed as a complex premise that is constructed specifically for a certain type of outcome that will reinforce the writers desire to display his cynical view of our future, but more it seems Hertzfeldt's desire with his latest is not that of looking into the eyes of the apocalypse, but more to bring our attention to what type of future we're setting ourselves up for and to possibly avert the worrisome course we're currently on. With such limited time to get such large ideas across the execution has to be precise. This brings me to what I found to be the most fascinating aspect of this dense and rather opaque piece that really requires ones full attention for its brief runtime. "That's the thing about the present, you only appreciate it when it's the past." 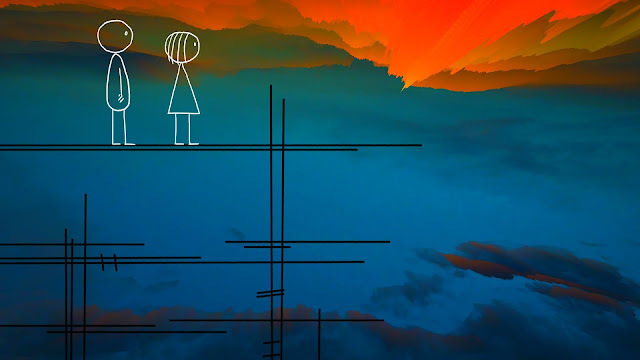 This single line of dialogue that future Emily (Julia Pott) speaks to an adorably innocent and oblivious Emily Prime (Hertzfeldt's niece Winona Mae) defines the throughline idea of the piece. Hertzfeldt sets up this idea of a society where people have begun cloning themselves and uploading their memories so that they may, in theory, live forever. In doing so and going about keeping these memories alive for such a time these clones have become obsessed with the past to the point that no new memories are being made. Despite life ever lasting there is no drive to continue living other than to fawn over what was once great. Younger generations essentially are non-existent as no one has children, but rather people only continue to clone themselves as these clones who become latched on to their uploaded memories, become less and less like their originators. Future Emily even states at one point that all new memories largely consist of clones staring at screens, watching old memories. It is a vicious cycle and one that reminds me of today's pop culture fascination with tapping into nostalgia. If we keep re-making and re-visiting old properties what are future generations going to reboot or re-make? Or even worse, be able to call their own? Writer/director Don Hertzfeldt's World of Tomorrow. In a generation where every little detail is documented, especially by people of a certain age on Instagram or Snapchat, almost the reverse of innovation has occurred. Where we were at once given this opportunity to push boundaries and connect on entirely new levels we have instead recessed to discussing how the "good ole days" were so much better because they weren't complicated by things such as social media. And yet, such opinions seem to only be blasted continuously on those very platforms. It too, is a vicious circle. The awareness of each others opinions almost ambushes the senses to the point one has to wonder how much further things might go before the human race implodes. Prior to social media, to the ability to navel gaze without being thought wholly self-indulgent, people simply existed with the assumption that there were those in the world who both shared and opposed their points of view, but other than years that might contain something akin to a Presidential election most simply kept to themselves and their small, but hopefully fulfilling lives. With the expansion of every individual's platform via the internet and social media the constant griping of how something is wrong with everything has naturally made the majority long for the days when things didn't feel as complicated. Even in this, as it is in everything, the idea of death looms large as longing for better days typically means longing for youth which typically leads to reminiscing which typically leads to regret which then leads to the determination to turn one's life around, but by the time such an individual reaches this point they're too tired to begin again and simply remain in that state of longing. Longing for the past that you never thought to appreciate in the moment. World of Tomorrow brings these fears and frustrations into the light and illuminating the need to live in the moment as much as we can. “Now is the envy of all of the dead,” says future Emily to the mostly uninterested younger Emily. While we sometimes try to make ideas more complicated than they are for the sake of sounding more intelligent World of Tomorrow is more or less about not taking the time we have with the people we love for granted. Future Emily talks multiple times about how she fell in love with inanimate objects like a rock, a fuel pump, or a monster she discovered and named Simon, but other than proving things have gone so far astray with these copies of clones it stands to show that Hertzfeldt really does believe in the simplicity within a complex idea. Love is always the answer. It's something of an easy way out when answering questions or mysteries that have been built up with no knowledge of the conclusion, but here love isn't simply about this untouchable light defeating the dark, but more it represents the enjoyment in existing that occurs naturally when you're not stuck thinking about how to make life more meaningful. There are more than a handful of great, powerful lines that make these thinly drawn stick figures seem wise beyond their years, but it seems Hertzfeldt's message could be boiled down to the idea of that famous quote from John Lennon that reads, "life is what happens while you are busy making other plans." If we all just take a moment to stop and ignore our programming that makes us fear death and instead embrace the here and now we might just be able to go on making memories for our future generations to appreciate and find inspiration in, even if they don't cherish them to the point of worship. It is a wonder a sixteen minute short film with sparse dialogue and something of an abstract visual style could convey so much substance and stimulate so much thought on the topics of our existence and the simultaneous swelling and breaking of our hearts when we think of the children we once were and the cynical adults we've all become, but this one does. World of Tomorrow is something of a miracle, a real stunner in this regard. Much like those bodies falling back to earth and lighting up the night sky, life is a series of events that usually sees us crashing and burning whenever we go out on a limb and try something new, but dammit if in the end the picture we paint isn't a work of beauty.